Discussion in 'Bible Prophecy' started by Joshuastone7, Sep 10, 2017. Let's start with gold and silver that is removed from the temple of God, and brought into the king for his own use. Dan 5:2 "While under the influence of the wine, Bel·shazʹzar gave an order to bring in the vessels of gold and silver that his father Neb·u·chad·nezʹzar had taken from the temple in Jerusalem, so that the king and his nobles, his concubines and his secondary wives could drink from them." Does this remind you of our Lords words in the end? We are advised by our Lord to buy gold from him. Rev 3:8 "I advise you to buy from me gold refined by fire so that you may become rich,"
One day the 8th king will attempt to enter the newly established spiritual temple in order to remove that spiritual gold from Gods people for it's own purpose. There will come a point that Christs remaining brothers on earth are transfigured, and the 8th king will come against them, those remaining loaves within the holy place, in order to cut their shackles free, so they think. Their form of worship is obvious from the text. 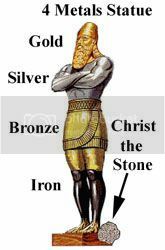 Dan 5:4 "They drank wine, and they praised the gods of gold and silver, of copper, iron, wood, and stone." Do those elements look familiar to you? Take note of the last two elements, wood and stone. Did you know that in Babel the bricks were made of clay and straw? I have remarked that it has become evident that there is "the deep state" and softer elements in US politics. That looks to me to be the iron and clay that just can't be mixed. Throughout the theme of prophecy you see a battle between Republic and Oligarch. History is a repeating battle stated by republics that turn into Oligarchs, denoting the battle between north and south. Down toward the end, these two elements exist in a collective arrangement. Dan 11:27 "As regards these two kings, their heart will be inclined to do what is bad, and they will sit at one table speaking lies to each other. But nothing will succeed, because the end is yet for the time appointed." It is Gods kingdom that will put an end to this collective wold governess.